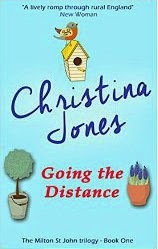 This month Accent Books have re-released Christina Jones' Milton St John Trilogy with new covers. They have also been on special offer in the Kindle bookstore, so of course I took it upon myself to top up my collection. This trilogy started calling me due to my part-time job where I input racing detail. It gives me something to daydream and play makebelieve about during my shift. I know, it's naughty but hey it passes the time. The book is set in the town of Milton St John, and reminds me a little of a frothy Polo. Granted I haven't read Polo since I was a teenager so I might just be romanticising it a little. Our heroine of the piece is Maddy. Unlucky in love, but successfully running her own business, living in horse racing village Milton St John with her younger sister - also an apprentice jockey she is at the heart of the neighbourhood. Peapods, the property across the road from her cottage, used to be a sports club run by her ex-boyfriend has a new resident. Horse trainer Drew Fitzgerald is moving his stable over from Jersey. The pair first catch sight of each other at a party held at one of Maddy's client/friend home. There is an instant attraction, which strengthens when Drew saves her from her letcherous ex. Soon Maddy finds out that the Drew is married and feels that they are coming too close for her comfort. Feeling that it would be wrong to come between and man and his wife, which is complicated even further after she meets Caroline and finds out that she really likes her. As if that wasn't complicated enough, Maddy's ex manages to dived the village with his latest stay rich and powerful scheme. The village rise up against the scheme as the racing season heats up. This is a fast-paced story, that didn't let me put it down for long. Probably why I read it in one evening. I've already started on the second book in the series.